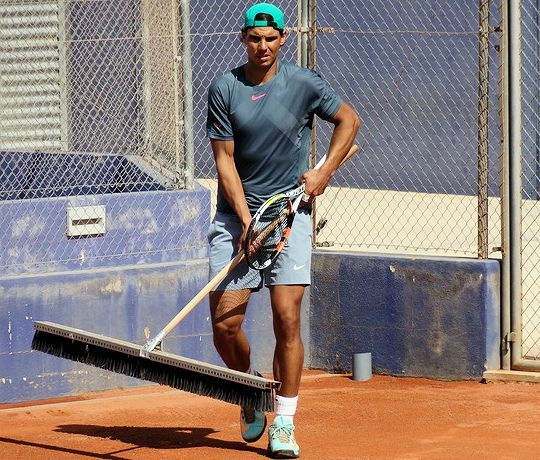 Rafa went home after Barcelona and got straight out onto the practice courts. Some of our members were able to see him there so I'm shamelessly pilfering their images and comments. 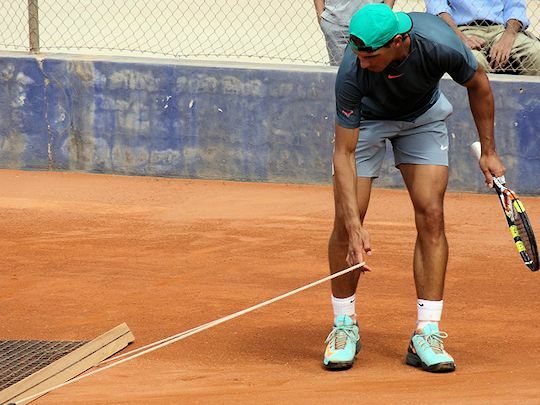 "We met a French family at Rafa's practices who'd seen him here on Friday when he was just back from Barcelona. They said he looked a bit grim and tired but was very much more cheerful by yesterday (Monday) when we also saw him. 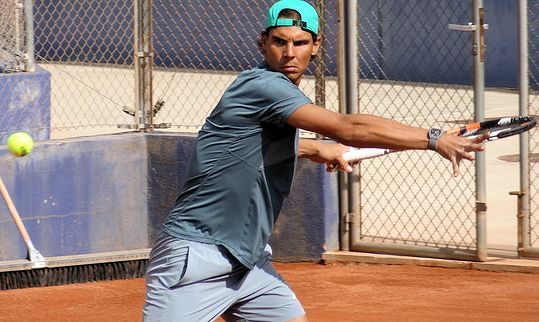 "There is always a lot of banter and fun at practices here with various friends and relatives dropping by and Rafa taking quite long breaks sitting and chatting between swinging his racquet. 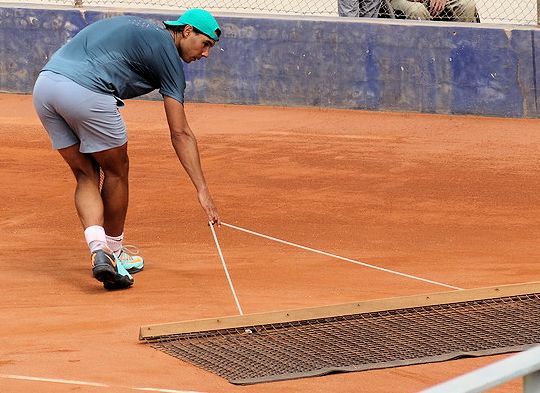 Yesterday there was loads of interaction with Moya and Uncle M-A and today with Tomeu and others on the court and Toni's wife and others on the bleachers near us. At least some of the talk was about football and golf, and some, in lowered voices, looked like gossip! 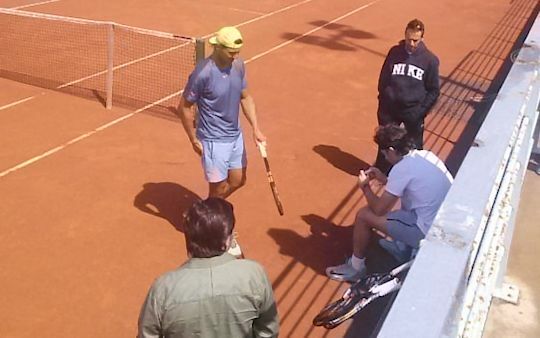 "So Rafa in good spirits yesterday and it was an exhilarating and long session with Moya. 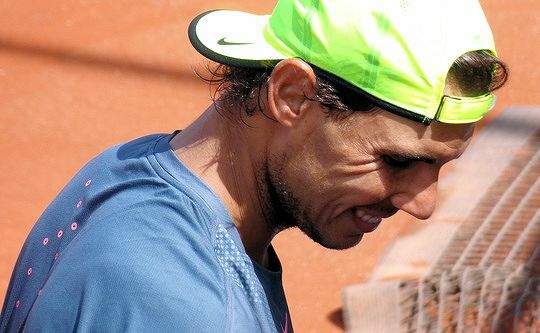 Today he was more grumpy going through his usual repetitive and focussed routines with Toni, but he was friendly, smiley (and utterly gorgeous in a tight long sleeved black sweater) when he came off the court. Gratuitous shirtless pics to finish.